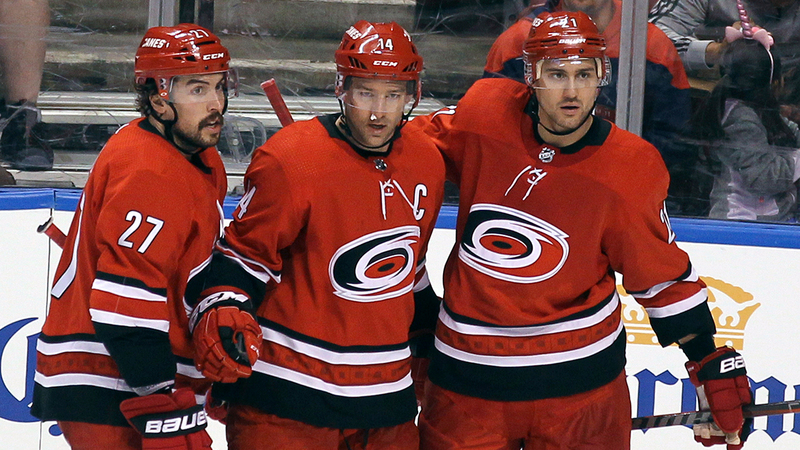 SUNRISE, Fla. (WTVD) -- Sebastian Aho scored at 1:46 of overtime and the Carolina Hurricanes beat the Florida Panthers 4-3 on Saturday night for their fifth straight win. The Panthers played their third consecutive overtime game, and they've lost each one - with the first two going to a shootout. Borgstrom broke a 2-2 tie with his second goal. Jamie McGinn passed from behind the net out to Borgstrom in front. Borgstrom fired a shot past Mrazek at 5:32 of the third. Pesce tied it 3-all when he backhanded a loose puck from in front into the net at 8:19. The Hurricanes got to Montembeault early, scoring two goals on the first three shots. McGinn put the Hurricanes ahead 1-0 after he stole the puck away from defenseman Keith Yandle and fired a shot past Montembeault 1:26 in. McKegg made the score 2-0 when his shot from in front beat the young goalie on the stick side at 2:05. Borgstrom's shot from the left circle went high into the net at 5:01 to close the score to 2-1. Pysyk got the puck off the faceoff and wristed a shot past Mrazek with 8:10 left in the first to tie the score at 2. The goal was Pysyk's first of the season. NOTES: Montembeault, 22, was recalled from AHL Springfield Feb. 27 on an emergency basis. ... Hurricanes D Calvin de Haan missed his second game with an upper-body injury. Hurricanes: At Boston on Tuesday night. Panthers: Host Ottawa on Sunday night.